Can you tell me about the EC hallmark? So happy I found your blog and site about Native Amercian Jewelry. In 2010 we made our second roadtrip through the US and one day found ourselfs in Panguitch Utah. The inn-keeper told us there was a powow in town. Not for tourist or anything, but really for the Native Americans themselfs. We went there and loved all the dances that were rehurst for the big contest the next day. We were told all the meanings of the dances and outfits. There were also some booths with people selling their hand made jewelry and I finally bought my very first bracelet from a lovely gentleman. A square turquoise with two feathers on each side. It’s very elegant and I love it very much. I wear it almost daily. I have pictures…. Next year we will go again on vacation in the US for our fourth road trip. This time we’ll drive the 89, from Calgary to Tuscon. This time I hope to find the perfect ring to go with my bracelet! I love your blog and it’s on my readlist now. Nice Navajo bracelet ! I am personally fond of square stones – they remind me of a bracelet my father wore. As far as the hallmark EC, I am not familiar with it and it is not in any of my hallmark references. Since you bought it directly from the artist, that is always the best way to document who made it…………but I know how easy it is to forget something like that if you don’t write it down. Since he is a contemporary artist, that helps a little bit but still I have no specific names to suggest. However, here are some Navajo silversmith family names that start with C that have more than one member who has made or makes jewelry. Maybe a last name will ring a bell and help you remember. My first thought was perhaps a member of the Charlie or Charley family. But Eugene Charley uses a cursive stamp with his entire name. 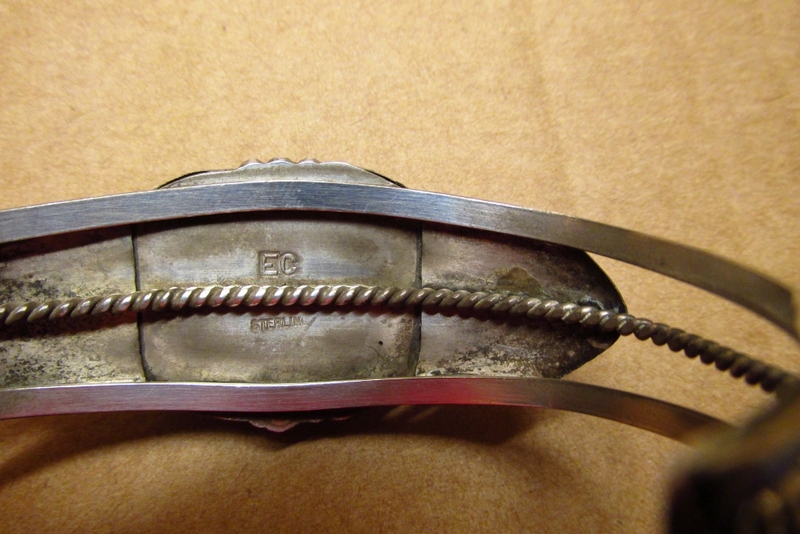 Here is an example of a Repousse barrette with his hallmark on the back. 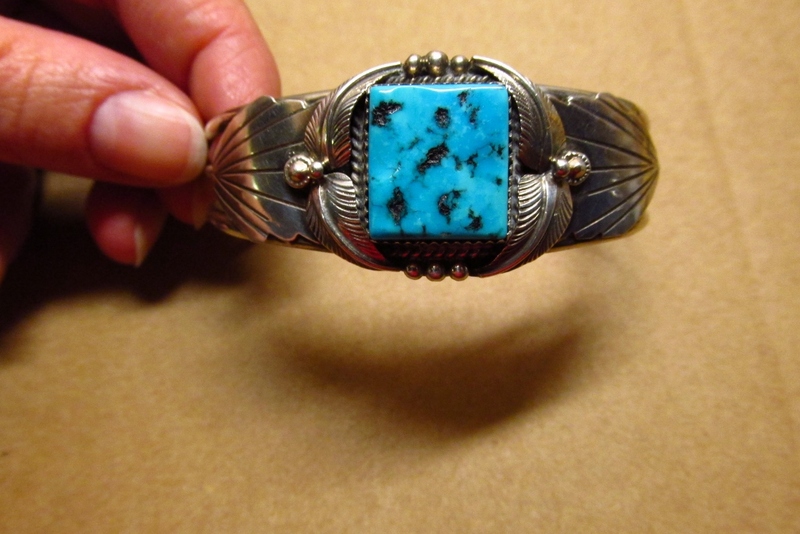 A hallmark website lists EC as attributed to Navajo artist Eddie Chee but the hallmark on the website looks different than the one on your bracelet. However that could be a possibility. So I am afraid I have not come up with a definitive answer for you but there are many readers of this blog and perhaps someone else might know. P.S. Right after I wrote this, I saw we have some baby bracelets that were made by Elton Cadman. Although they are not hallmarked (it is sometimes hard to find a large enough area on a baby bracelet to put a hallmark) we did have in our notes that EC was Elton Cadman………so that is a possibility ! 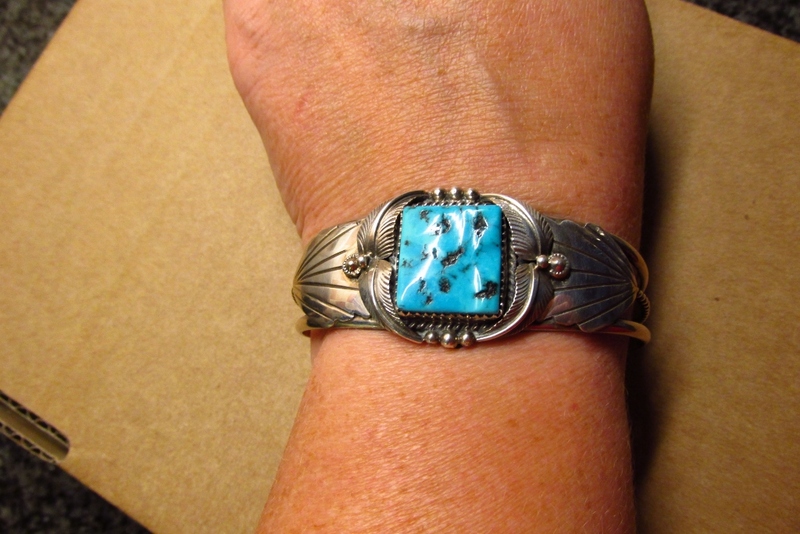 This entry was posted in Bracelets, EC, Hallmarks and tagged bracelet, cuff bracelet, hallmark, native american, navajo, sterling silver, turquoise by Native American Jewelry Tips. Bookmark the permalink.